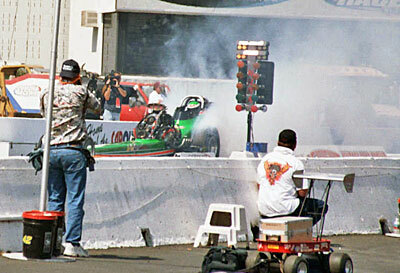 August 5-7, 2005: The Goodguys 8th Nitro Nationals at Pomona was truly Murphy's Law - "What can go wrong, will go wrong". Hopefully, this is a law they won't break again in the near future! 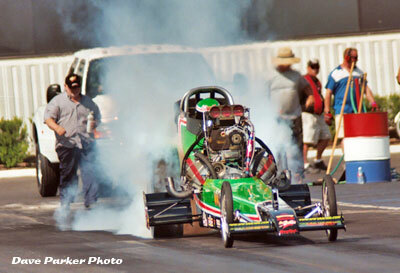 Leaving Santa Rosa, loaded for bear, Jim Murphy and crew had high hopes for a successful weekend in sunny Pomona. However, the first omen of trouble came early when they blew an inside rear tire on the tow truck and tore up the rear fender. After putting the spare on and fixing the truck the best they could it was off to the Fairplex. Once in Pomona they put new tires on the truck. The weather was in a word - miserable, about 95 to 106 degrees and very high humidity due to some close by tropical storms. The asphalt was 135-140 degrees, with no breeze. The spectator count was understandably way down, the racers were suffering. Mother nature won the event early on. Our first qualifying session was yet another precursor to "this weekend isn't going to be ours". Paired with Rick White, who left the staring line before the tree was even activated, Murphy took his time lighting his second staging light, waited a bit and then left without seeing a yellow (He assumed the guard beam would automatically start the tree) wrong, no time. This negated a good run that hurt a few pistons. 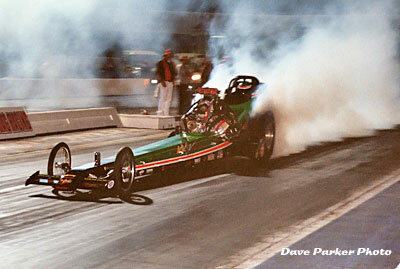 They came back that night with 7% less nitro in the tank and ran a decent 6.04 at 246. Everything looked clean and they were felling that they were on the back side of hurting the engine, wrong again - they hurt pistons - again. 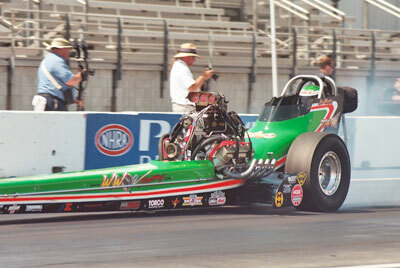 That run would ultimately plant Murphy in the # 5 qualifying position. 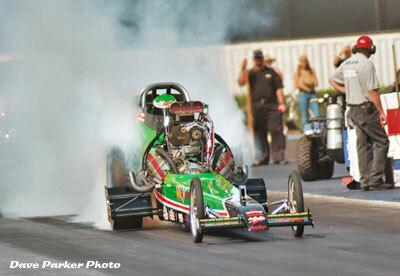 In round one of elimination on Saturday night Murphy lost a very close race to Jeff Diehl 6.15 at 238 to his 6.16 at 230. After the run they found that the manual retard on the magneto had broken and instead of Murphy retarding the timing 5 degrees, it retarded it 18 degrees. Guess that explained why the car just blubbered down the track. 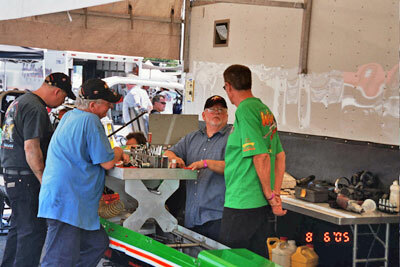 The crew spent most of the day Sunday trying to figure out why they were hurting pistons and had no horsepower. They narrowed it down to the magneto or the fuel system. They put the car in the trailer and headed north. On the backside of the Grapevine the front brake rotors started grinding. A little further up the road the trailer fender looked funny. Pulling over Murphy discovered that somewhere behind them was the right front trailer wheel and tire - the studs had sheered. Ah, what can go wrong will go wrong. They limped into Porterville and called it a day. 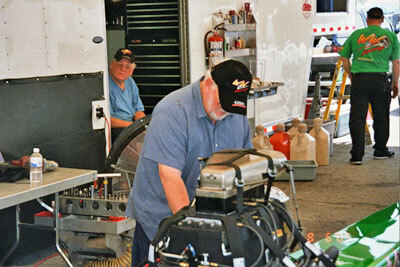 Monday they fixed all the damage at Tim Beebe's shop and headed north again to the shop of Blake Robertson where Bob Wyman Jr. is putting his magic to work to checking our magnetos . Long story short, this was the first good news we had gotten all weekend. Bob found multiple (fatal) problems with the mags and 5 very bad plug wires. Not to end things to quickly we found out our fuel pump had also taken a dump. 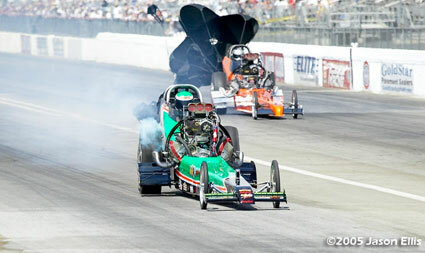 The mags and fuel pump are now in the hospital and we expect a full recovery in Seattle September 2nd thru the 4th. 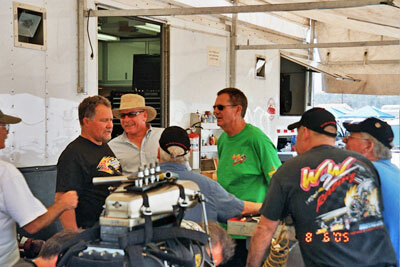 As described above, Jim Murphy was paired with Rick White for the first qualifying session Friday afternoon. White left before the tree was activated and Murphy reacted to the sound and left early as well. Neither car got a time and both made good runs. Some unhappy folks after this one. Dual red lights tell the tale. 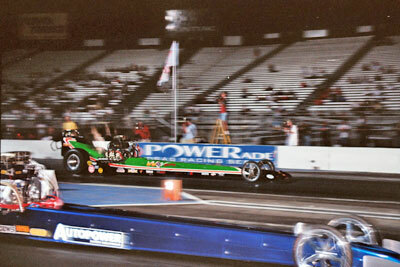 The second qualifying session was Saturday night and ironically, Murphy was once again paired with Rick White. This time neither driver was going to chance leaving early - Murphy waited even longer than White. 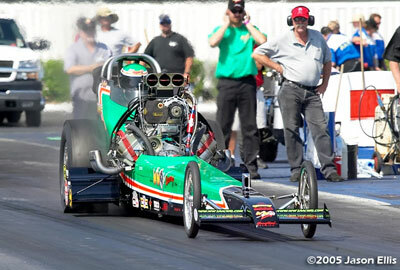 Both drivers found the night air to their liking as White ripped of a 6.055 at 236.63. 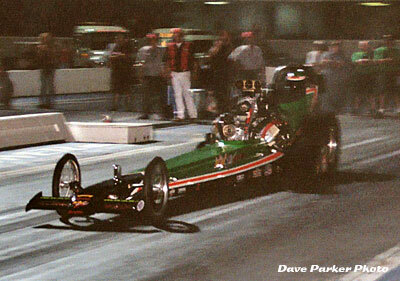 But Murphy did him one better with a 6.048 at 246.71 which, for the moment, was good for the # 1 spot. 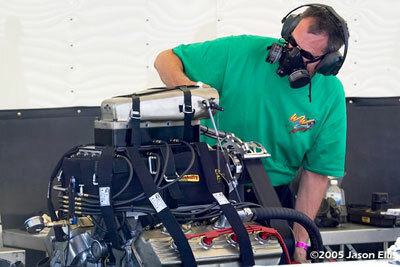 The engine gets warmed up prior to the second session of qualifying. In his third and final attempt Murphy was paired with Brad Thompson. Thompson failed to hook up to his liking on the super hot track and clicked it early to a 6.800 at 210.37 leaving him on the bubble. 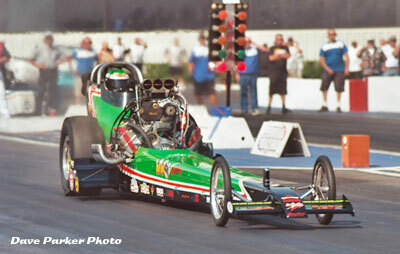 Murphy shut off early as well to a 6.267 at 232.13. 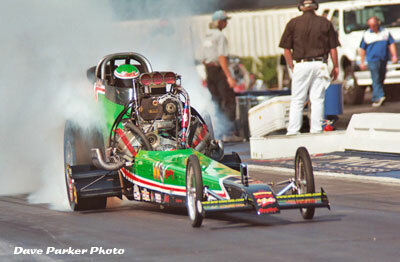 First round of eliminations was run Saturday night and Murphy was paired with Jeff Diehl. Diehl got a very slight lead off the line, didn't smoke the tires, and held on for a 6.152 at 238.09 win over Murphy who was right there with a 6.165 at 230.00. 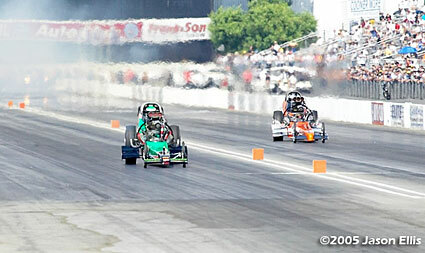 This was a very close drag race! 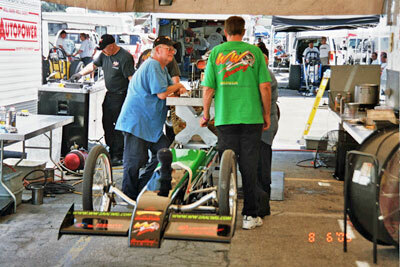 However, it marked the end of Murphy's racing for the weekend. BUT, Murphy's law was still in force. Instead of racing, Sunday was spent trouble shooting which finally revealed a bad magneto and fuel pump.